On Wednesday, TMZ broke the news that the singer is single again. The website also quoted sources who said their busy work schedules had played a factor in their decision to part way but that the two would always remain close friends. 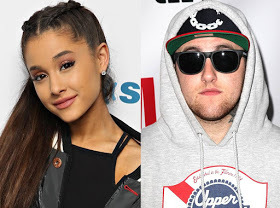 Ariana Grande took to social media to address her breakup from beau Mac Miller, whose real name is Malcolm McCormick. 'I respect and adore [Malcolm] endlessly and am grateful to have him in my life in any form,' wrote the 24-year-old in an Instagram story. The message was written around a picture of the Dangerous Woman singer and the 26-year-old rapper locked in an embrace while lying on a couch. The full text read: 'Hi! This is one of my best friends in the whole world and favorite people on the planet Malcolm McCormick. 'Unconditional love is not selfish. It is wanting the best for that person even if at the moment it's not you. The two recording artists have known each other since they were 19 and publicly confirmed their romance in September 2016. In an issue of Cosmopolitan, published in March, Ariana revealed that she's 'loved and adored' Mac since she met him at 19. Explaining why they didn't begin dating then, despite mutual adoration, she said: 'We weren't ready at all, though, to be together. It's just timing. We both needed to experience some things, but the love has been there the whole time'. They were last photographed together at Madonna's Oscar party in March.